g> was announced today. 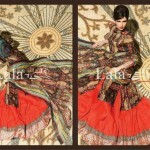 It consists of 4 piece pashmina suits. 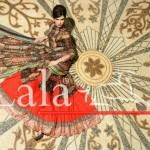 Included in the suits in Lala Pashmina winter collection 2012-13 are shawl dupattas, linen shirts, trouser, sleeves, embroidered border and embroidered motif for back. All of the outfits have many colors. Mostly quite bright colors have been used on the outfits. However, there are some sober-looking outfits also. The unstitched fabrics in this collection are appropriate for making stylish dresses for casual and party wear.